Classical Music presentations may dwindle for Boston residents during the summer, but New England is alive with concerts that BMInt readers may enjoy. Within a three-hour drive of Boston there are 378 listed in our “Upcoming Events” for the period between now and the end of August. The names of the presenters include Apple Hill, Aston Magna Festival, Bay Chamber Concerts, Boston Chamber Music Society, Boston Landmarks Orchestra, Boston Midsummer Opera, Boston Opera Collaborative, Bowdoin Festival, Cape Cod Chamber Music Festival, Frederick Collection, Heifetz International Institute Summer Festival, Kneisel Chamber Music Festival , Maverick Concerts, Mohawk Trail Concerts, Monadnock Music, Mt. 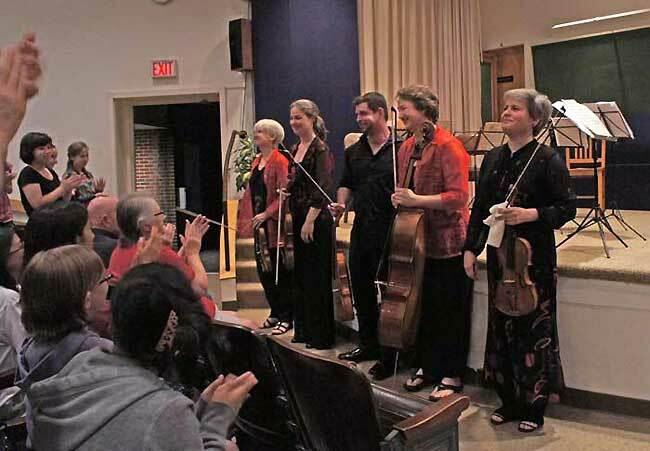 Desert Festival, Music Mountain,Music at Eden’s Edge, New Hampshire Music Festival, Portland Chamber Music Festival, Rockport Chamber Music Festival, Salt Bay Chamberfest, Tanglewood, Tannery Pond Concerts, VentiCordi, and Yellow Barn Festival. Last night, June 25, this reviewer attended his first concert at the Marine Biological Laboratory at Woods Hole. The Colorado String Quartet (Julie Rosenfeld and D. Lydia Redding, violins; Marka Gustavsson, viola; and Katie Schlaikjer cello) appeared for their twenty-first season under the aegis of Soundfest, an apprenticeship program the quartet runs in Falmouth each year for about sixty students from age ten to undergraduate. And one could tell from the audience, which included the most rapt collection of kids I have ever seen (even in the Bartok), that one, there is a future for classical music and two, Soundfest works. The Lillie Auditorium at MBL is a low-ceilinged, fan-shaped lecture hall with a carpeted stage, revealing a blackboard and office doors on its back wall. It is not a place where the sound of a string quartet blooms, yet it projects a clear and powerful enough sound for the music to be enjoyed. The quartet offered a thematic program based on Hungarian gypsy music consisting of a work each by Haydn, Bartok and Brahms. First violinist, Julie Rosenfeld led the opener, Haydn’s Quartet in G major op. 76 no. 2 (Quinten) with an athleticism that her partners and the audience found infectious. This was not snuff-box playing; the Colorado is a solid ensemble and their reading was energetic, well tuned and taut. Before the Bartok Quartet #3, second violinist, D. Lydia Redding gave a charming talk about the program’s theme. We were delighted to learn, for instance, that second violinists are usually more fun at parties than firsts. We also learned that the rhythms in the Bartok were going to be toe- tapping, as long as one had legs of dissimilar lengths! Redding sold the piece as a collection of gypsy tunes combined by Bartok in a manner that encouraged the meeting of East and West in a European ‘tween-war era. There was, in fact, quite a lot of sandal and flip-flop tapping on the Lillie Auditorium stage. Though the piece was perhaps oversold as an accessible compilation of hummable tunes, the actual performance had a rhythmic drive and visceral excitement that made converts of the audience. The foursome was joined by John Largess, the violist from the Miró Quartet, for the Brahms Quintet in G major, op. 111. Though the opening Allegro was marred by some iffy tuning, the group extensively re-tuned before the following Adagio which was offered with a splendid prayerful intensity — perfectly tuned sections sans vibrato alternating with vibrated passages. If the last two movements did not rise to Olympian heights, it was more because of the deficiencies of room than the skill of the performers. In a Brahms quintet the competing claims of sonority and transparency can only co-exist in a space that enhances the development of the full harmonic spectrum of the instruments. And at the Lillie there was brightness denied, though there was clearly excitement which was rewarded by a standing O. The remaining concert in this series takes place on Thursday, June 30, 7:30 p.m. at the Falmouth Academy. BMInt publisher, Lee Eiseman, occasionally opines in this column. Thanks for the excellent review. If you review the concertr tomorrow night (6/30), please be sure the cellist’s name is spelled correctly, namely, SCHLAIKJER. Where on earth did you get “Schlanjer”? Thank you for correcting the spelling of Katie Schlaikjer’s name. But, would it be possible to correct mine, as well? Rosenfeld, not “field”. My teacher, Szymon Goldberg, often called me “Rosenberg” but I can understand that mistake. Thank you for attending Soundfest this year.